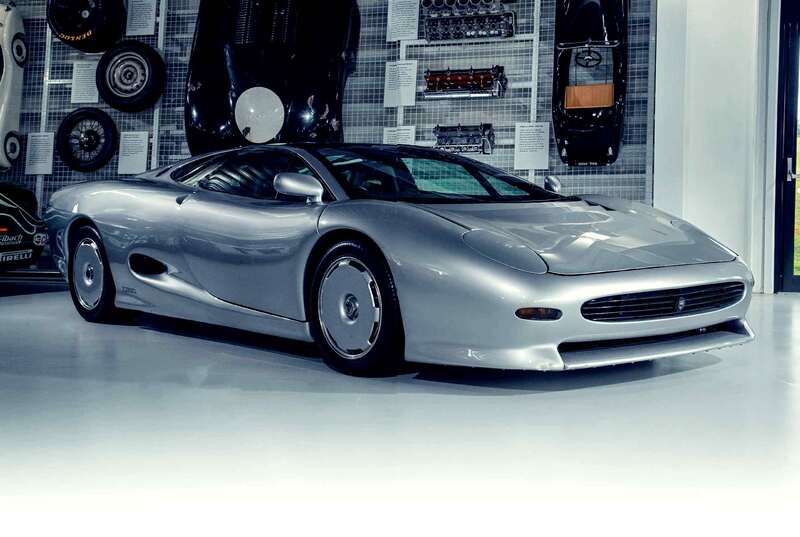 Perhaps one of the most remarkable things about the stunning XJ220 is how similar the eventual ‘production’ car looked to the original 1988 concept. At first glance, those flowing lines look almost identical, and it’s only once you get closer than you can spy a myriad subtle differences. Of course, under that skin, the differences are substantial, with the original concept boasting a quad-cam V12 and four-wheel drive. When the original prototype was put together, mostly out of hours and with chief engineer Jim Randle calling in some quite remarkable favours from companies such as Triplex for the glazing and FF for the transmission, the aim was to build a fully-functioning car. So, unlike a lot of concepts, there is fully engineered suspension, steering and even braking. Sadly, time ran out, so the dream of having a running prototype was never actually achieved. In fact, so tight were the timescales that the concept car was barely finished in time for the 1988 Birmingham Motor Show, and it was one of the last cars brought into the halls – on the morning of the day that the doors opened. It went down an absolute storm, bringing Jaguar the sort of media attention it could only have dreamed of. Remember, at this point, Jaguar was still an independent company punching well above its weight, but all too aware that a tie-up with another major manufacturer would be inevitable. The XJ220 project may have helped Ford put its plans together for a takeover – that would happen in 1990. Before that, the project to turn the XJ220 into a production car was already gathering pace. Tom Walkinshaw was chosen to make it a reality, but the concept would undergo some fundamental changes before buyers could drive one away. The V12 had been an obvious choice for the XJ220, as one of Jaguar’s key production engines. But, the weight had made the engineering team decide that four-wheel drive was necessary, which added complication and yet more weight. Walkinshaw reckoned a twin-turbo V6 would be a better idea, with rear-wheel drive only. While this certainly made sense from a weight-saving point of view, Walkinshaw’s motives may not have been purely engineering based. TWR had bought the rights to the David Wood (Cosworth) designed MG Metro 6R4 engine, a naturally aspirated V6 quad-cam engine built very much with racing in mind. Walkinshaw’s team developed this engine with turbocharging to power the XJR-10 and XJR-11 of 1989 and 1990 – prototype racers (1990 XJR-15) aimed at the American IMSA series, and the World Sports Car Championship. These engines were effectively outlawed by legislation for the 1991 series, so Walkinshaw had an engine design he could no longer do anything with… Whatever the reason, this V6 engine was further redesigned for the XJ220, and developed a mighty 542bhp at 7000rpm. It was undoubtedly enough for quite remarkable levels of performance, taking the new car to a proven 217mph and offering a 0-60mph time of under four seconds. It also managed to do this while meeting the latest emission standards – something it wasn’t thought possible to achieve with the V12 naturally aspirated motor. The problem was, it wasn’t a V12, and those in the market for a supercar could be quite sniffy about that sort of thing – similar concerns held back the also-impressive Honda NSX. Whether this change led to cancelled orders is a point for debate, but it was certainly true that the original wave of optimism had faded somewhat, not helped by a global financial slump and the bursting of the classic car investment bubble. Certainly, plans for 350 cars were never realised, with only 281 completed. Nonetheless, the XJ220 had gone through a thorough test programme, and our second car here is one of those, built in 1991. It is number eight of ten development cars, and was present when the new factory at Bloxham, Oxfordshire was officially opened by Princess Diana. It appeared at the Tokyo Motor Show that year and more recently, was used by Pirelli to develop new tyres specifically for the XJ220 – now sold by Jaguar Classic. 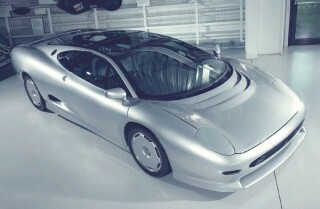 While technically a pre-production XJ220, it is to all intents and purposes identical to the production cars. As both vehicles are owned by the Jaguar Heritage Trust, we were able to spend several hours casting our eye over them, to spot the differences. The main external difference is the change in length, with some 20cm removed from the wheelbase. This loss was all accounted for rearward of the door, so the side windows are much smaller. Conversely, the side intakes are much larger on the production car. While the front-mounted radiator is carried though from concept to production, there was still a need to cool the engine bay, which is also why the production car has a slotted grille at the base of the glazed engine cover. From the rear, another key difference is the rear lights. Despite much frustrating head scratching, we have not been able to identify where the rear lights of the concept car came from. They were manufactured in Germany. The production car uses the chunky rear lamp clusters of the Rover 200 R8, launched in 1989. Side indicators were also a legal requirement, and these came from the Ford parts bin. The external mirrors also differ, being from the Citroen CX – they are aerodynamically efficient and used by several manufacturers, including TVR. Note that while the passenger mirror is attached to the nearside door on the production car, it is attached to the front wing on the offside to ensure good rearward visibility. The rear spoiler treatment differs too, with the spoiler swinging into the broad flanks, helping to break them up. Both cars have beautifully sculpted undersides, designed to diffuse the air as it travels beneath the car. One amusing discovery is that the concept car actually wears wheeltrims. They are designed to replicate the alloy wheels fitted to the production car and must have been a fairly late addition. Behind them sit the lattice alloy wheels that we’ve seen on pictures of the car when it was approved for display by the Jaguar management team in 1988. The trims were in place by the time the concept appeared at the Motor Show in 1988. One other difference is the windscreen wipers. The original concept had a single, pantograph wiper, which has sadly been lost over the years. What is especially puzzling is that the spindle for that wiper almost rests on the front cover, so one wonders how it ever fitted anyway. The production car uses two arms for a more complete sweep of the windscreen. The production car is similarly sparse inside, with no unnecessary adornment. Some switches are Rover Group, some are from Ford but the column stalks are shared with the Jaguar XJS. The steering wheel is a JaguarSport item, which has a similar look to the Momo wheel of the concept. Naturally, the fit and finish is a bit better in the production car, with the interior designed to cope with wear that the concept would never see. The gear layout changes too, with the concept boasting a dog-leg first gear. The production car, still only with five speeds, follows a more traditional layout, with fifth out on a limb. It’s intriguing to ponder how different things might have been. Would the XJ220 have sold better with a V12 engine? Would all-wheel drive have helped it accelerate even more quickly? As this was the only example built with a V12, which never ran, we will never know. Overall though, while there are plenty of detailed differences to keep the determined happy, both cars have such style, such elegance that it’s a pleasure to spend some time in their company. The good news is that such access not restricted to magazines editors, as both cars (at the time of writing) are on display in the Jaguar Heritage Trust’s home at the British Motor Museum. While it’s very much a case of look but don’t touch, you can still take in the enormous size of both cars, and those swooping looks that have never been replicated. The road car is just out of MOT at the time of writing, but does make forays out onto the road from time to time. That and tyre testing have helped it to clock up 10,738 miles over the years. The team at Jaguar Heritage tell me that the main issues when driving it are the sheer size of the thing, and that it doesn’t really want to be driven slowly. Given that the top speed is almost 150mph more than the legal speed limit, that doesn’t surprise us unduly. So, it’s not practical as a road car, it was not a commercial success and many people still bemoan the lack of V12 power. Yet, when you just look at the XJ220, you can’t help but fall in love. The shape is so beautiful, so dramatic that it still looks like a concept car that just happens to be road legal. Making that happen must have been a dream job for the JaguarSport engineers at the time – a completely unique day job. That’s what the XJ220 is. It’s still dream-inducingly special. Twin-turbo V6 an eternal talking point. Not too dissimilar, with the door-mounted gauges making it to production. Interior is remarkably plain really. No unnecessary bling. Conventional shift pattern. Quad-cam V12 would not see production. Concept gearbox has a dog-leg first gear. Interior has similar themes to the eventual production car, but subtle differences too. 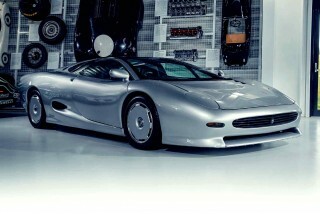 It is now over 30 years since the XJ220 concept was unveiled. It has aged well. Rover 200 rear lamps (below), detailed spoiler changes and note body side moulding. Engine bay cooling louvres also help break up the rear styling. Greater length very obvious from this angle. What vehicle is this rear lamp from? Fake wheels uncovered! Actually a pre-production test car, Number 8 was shown at the Tokyo Motor Show in 1991. Headlamp covers drop down. Only one door mirror is actually on a door. Same louvres, different wipers. Original concept can still be seen at the Jaguar Heritage Trust's display at the British Motor Museum. Much smaller intakes on the concept. Missing windscreen wiper.